The Canon Vixia HFS100- This is a high definition camera that does both video and still images. The Canon Vixia HFS 100 records on a removable card, which is a convenient way to record video. This one captures a whopping 6 hours of HD video to a removable SDHC card as well as 8 Mp (megapixel) digital stills. 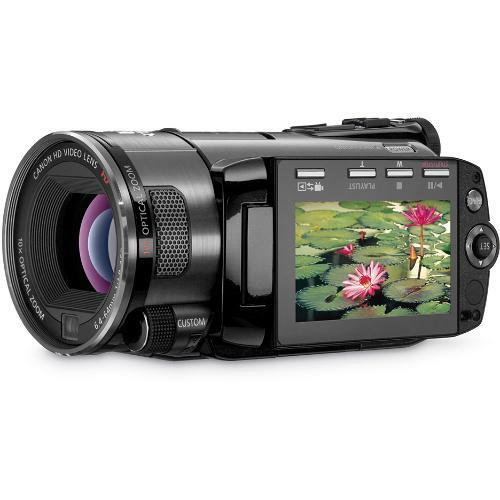 Being a high-def camera, you might expect the canon Vixia HFS100 to record in AVCHD only, which can sometimes make editing a hassle, but the spec sheet for the HFS 100 says the format records is MPEG4-AVC / H.264, which will make it much easier to transfer and edit the footage. Video editing software is beginning to be able to deal with high-def formats but lots of programs still do not accommodate AVCHD. That makes conversion before editing necessary and that usually robs you of some of that HD clarity. Since the vixia records in a version of MPEG4, which is more universal, compatibility with editing software should not be as much of a problem. That’s a huge advantage for anyone who wants to consider editing the video they take. To make great videos, you’ve probably heard me say that quality audio is even more important than quality video. So the canon vixia hfs 100 won points for having microphone and headphone inputs. (terminals) They are stereo mini jacks, which is standard for this size camera. Putting in an XLR input would necessitate having a larger overall camera body. One of the latest trends in video camera automation is what they call Face Detection. The camera senses what part of the picture contains faces so they provide extra sharp focus and better exposures of every face in a shot. Faces are often the single most important element of any shot. Some people are eager to make video look like film. One way to help achieve the look of film when you are really shooting video is to use 24 fps (frames per second) frame rate instead of 30 fps as is the case with standard video. The canon Vixia HFS 100 allows you to do this. It has 24p Cinema Mode gives your videos a “film-look” – enhanced when used with the CINE setting. Just be aware that if you want to use features like this, you will more than likely run into extra editing hurdles and you will need a fairly sophisticated software to accommodate that frame rate. Another feature of this camera is quality image stabilization. Image stabilization features have gotten so much better over the years, but I still recommend a tripod! Love my tripod….love my tripod. Keep repeating that to yourself! Canon’s Optical Image Stabilizer claim’s superiority because it corrects for both small scale and large scale camera movements. On one hand, the basic image stabilization feature is supposed to correct for hand shake, moving subjects and the “inevitable slight bump”. Then they added the “SuperRange Gyro” feature to include image sensors designed to correct for larger scale movement, such as videotaping in a moving car. The HFS 100 has a 10x lens with 4 fixed zoom speeds for fluid transitions. In short, this is a fantastic high def camera that records on a memory card. Records in MPEG 4 format so video should slide right into most video editing programs. A bargain for under $1,100.